Platinum is a white metal, but unlike gold it is used in jewellery in almost its pure form (approximately 95% pure). Platinum is extremely long wearing and is very white, so it does not need to be Rhodium plated like white gold. 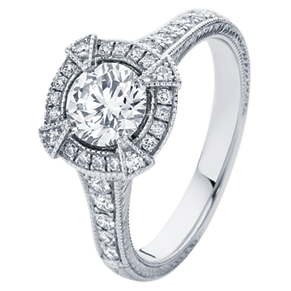 Platinum is very dense (heavy), so a platinum ring will feel heavier than an 18ct gold ring. Platinum is significantly more expensive than 18ct white, yellow and rose gold. Also, Platinum does tend to scratch more easily than white gold and requires regular maintenance also.